Can You Spot the New Street Art in the Space Station? After a long journey, a famed urban artist gets his work launched into orbit. Is it considered street art if it's whizzing high above the streets at 4.76 miles per second? Credit one lucky guy for possibly expanding the definition of urban art, now that he has a piece in low-earth orbit on the International Space Station. That would be an Invader original, crafted by the classic video game-obsessed French artist. It turns out he has a friend inside the European Space Agency, and after years of effort, he convinced the organization to accept one of his alien-themed mosaics, subject it to rigorous tests, put it a sealed baggie, and blast it into the stars. The launch occurred in July 2014; it's taken this long for the piece to get glued to a wall in the Columbus module. I would have never imagined that my Space Invaders project might take me that high. 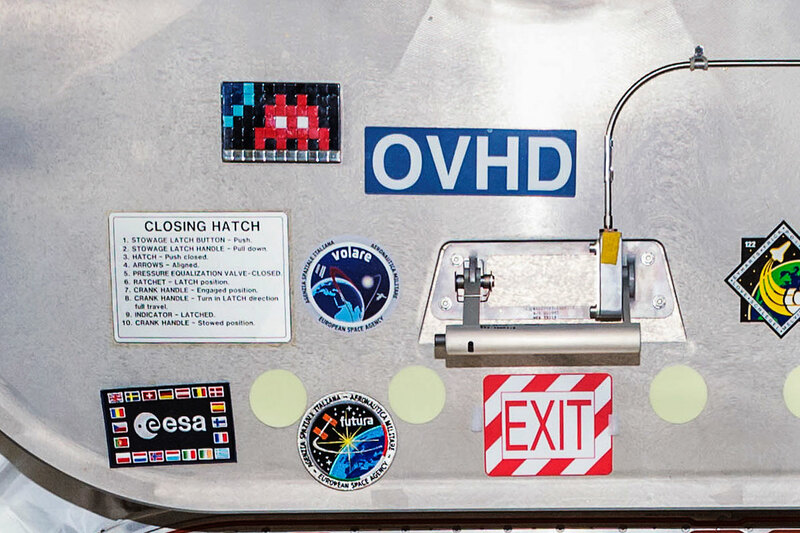 What looked like an unrreachable dream has come true as Space2 is the first space invader ever installed on a spaceship among real astronauts living in zero gravity and with Earth and the universe as a background ! Art, Science, space conquest : a great move! Helmets off to Invader—and the amazing connections he must have. If you ever want to know if his art is soaring above your city, look for the moving space station on this Atari-style map.